Getting Bi: Voices of Bisexuals Around the World, Second Edition is the broadest single collection of bisexual literature available today. 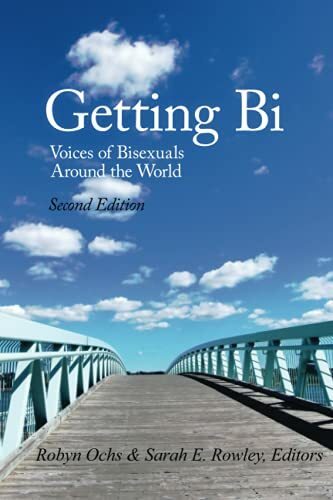 Getting Bi collects 220 essays from around the world that explore bisexual identity. Topics include coming out, relationships, politics, community, and more. The book also addresses the intersection of bisexuality with race, class, ethnicity, gender identity, disability and national identity. Authors from 42 countries discuss bisexuality from personal perspectives and their own cultural contexts – providing insight into societal views on bisexuality from countries ranging from Colombia to China.“This groundbreaking book is the perfect read for bisexual, queer, curious, and questioning people; everyone from the newly out to long-time community leaders; and bi allies of all stripes,” said Matt Foreman, Executive Director of the National Gay and Lesbian Task Force (NGLTF). "Getting Bi is one of the most important recent contributions to the global struggle for human rights. By enriching our understanding of bisexuality within so many cultural and geographic contexts, this anthology serves as a magnificent tool for building support and respect for the the sexual rights of each one of us," said Paula Ettelbrick, Executive Director of the International Gay and Lesbian Human Rights Commission. Robyn Ochs, Ed.M.is co-editor of the anthology Getting Bi: Voices of Bisexuals Around the World, and has taught courses on gender and sexuality. Her writings have been published in numerous bisexual, women's studies, multicultural, and LGBT anthologies. She is a professional speaker and workshop leader who has spoken at hundreds of colleges and universities, and keynoted numerous conferences. Robyn lives in Massachusetts, and on May 17th, 2004—on the first day it was legal—she married Peg Preble, her long-time partner. Their wedding was covered on page 1 of the the Washington Post. Robyn serves on the Board of Directors of MassEquality. The National Gay & Lesbian Task Force awarded Robyn the 2009 Susan J. Hyde Activism Award for Longevity in the Movement. Sarah E. Rowley is a member of the Boston Bisexual Women’s Network and is co-editor of this anthology. She works to end partner abuse in the lesbian, bisexual women’s, and transgender communities as President of the Board of The Network/La Red. Robyn Ochs, Ed.M has taught courses on gender and sexuality. Her writings have been published in numerous bisexual, women's studies, multicultural, and LGBT anthologies. She is a professional speaker and workshop leader who has spoken at hundreds of colleges and universities, and keynoted numerous conferences. Robyn lives in Massachusetts, and on May 17th, 2004—on the first day it was legal—she married Peg Preble, her long-time partner. Their wedding was covered on page 1 of the the Washington Post. Robyn serves on the Board of Directors of MassEquality. The National Gay & Lesbian Task Force awarded Robyn the 2009 Susan J. Hyde Activism Award for Longevity in the Movement.Sarah E. Rowley is a member of the Boston Bisexual Women’s Network and works to end partner abuse in the lesbian, bisexual women’s, and transgender communities as President of the Board of The Network/La Red.